It’s Sunday morning and time to walk the dogs. Bert is the first to get ready – Dee manages to put the harness and lead on him and his excitement can’t stop him yapping continuously until he eventually gets out the door. Dee then does exactly the same with Honey – I can never manage to get them ready as there is too much wriggling going on. And off we go, Ballincollig Regional Park is our normal weekend walking destination. Thankfully the weather is nice so there is no need for coats. We’ve put the call into our buddies Tommy and Joan who will be down there walking their dog, Tammy. Mum and dad will also join us for a stroll and a chat. As always the dogs are pulling and dragging, the walk is an explosion of the senses for them, sniffing and exploring at every opportunity. The stroll to the park is through a few housing estates, down a road and when they get there it’s even more escalated with lots of activity and many others walking their four-legged ones. We do a few circuits of the field, the dogs stopping every now and then to do their business (Dee having to do the necessary clean up..yeuch!) and we head to the weir where they get to splash and run in the water and rehydrate after all of their exertions. We have our chats and enjoy watching the dogs exploring and if we think they are calm enough we head for a coffee and a delicious bun or two from the lovely Margaret at Cafe Chico. Honey won’t settle when we have a coffee and poor Bert believes he is one of us and wants to be sitting at the table sharing the goodies so it’s not always possible. We all stroll back and if we haven’t had coffee in the park we might buy a few buns or some salad on the way and have it back at ours. 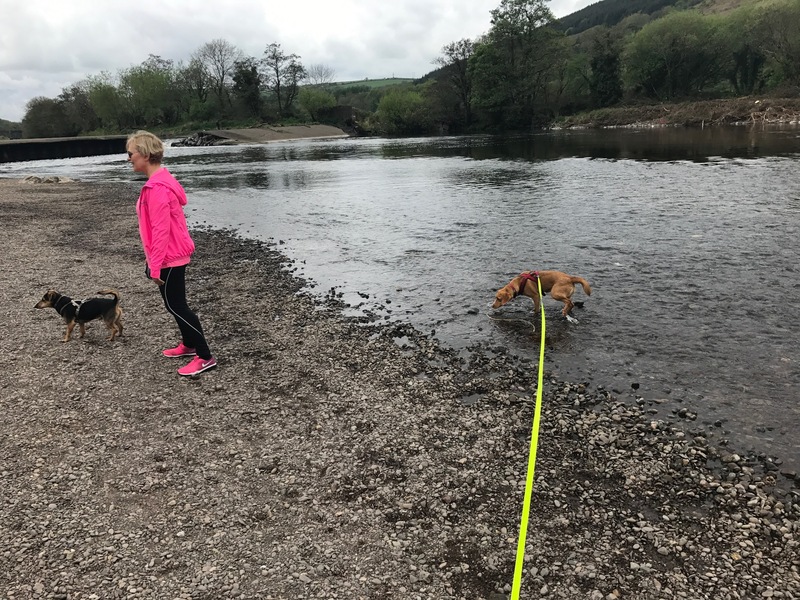 This simple little weekend routine is great for the soul – watching our two four legged ones exploring and having fun is just the tonic to recalibrate ourselves after a busy week. Dog walking – my favourite time of the week. p.s. I never wanted a dog! This entry was posted on April 23, 2017 at 6:11 pm and is filed under Friendship, Relaxation. You can follow any responses to this entry through the RSS 2.0 feed. You can leave a response, or trackback from your own site.